Ever wonder how to plan a concert or how to get more people to come back each time? When I was a touring musician, I did a lot of the booking for my band’s shows. Later on as a tour manager and label executive at Fearless Records and Sony Music, I learned even more. So here are some tips on how to organize a concert, event planning, and gig promotion. 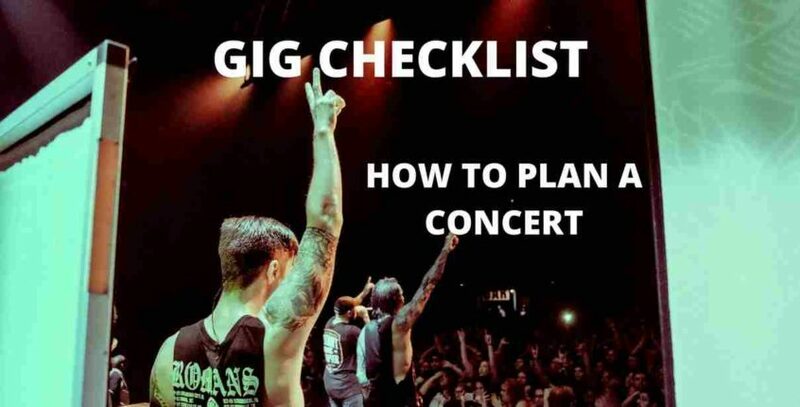 Plan a live music concert event using this concert planning guide. 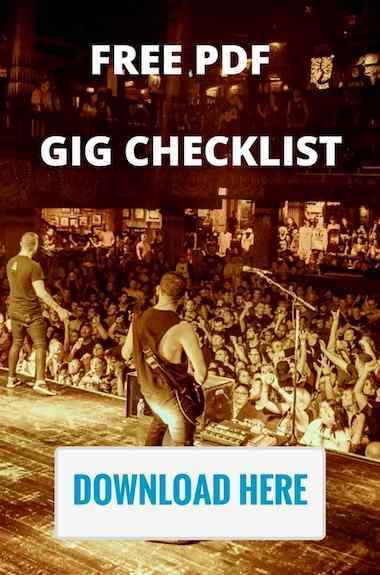 Review the gig checklist (click here) and customize it for your concert. Setup a concert with the venue, and confirm your budget. Do gig promotion online, street marketing, and print media. Handle logistics and technical aspects of the concert. Most of all ensure fans have a good time and come to your next gig. Make your concert an event, not just a performance. At most concerts activity is limited to waiting around, watching music, or buying merchandise and drinks. So plan other things for people to do while at the event. Give the evening a purpose. Is there a mission or cause? Convert concert goers to fans. Give these people another reason to come back to your next show. Furthermore the media will be impressed if you do something nobody has done before to market your event. The GOAL is to have more people come out each time you play. At first you have 20 people at your show. Then 40…60. And onto 100, 200, and so on. Branded concert series for your band. Four events a year. Make each concert bigger than the next. I got this idea years ago from a Japanese band I worked with called Eastern Youth . They made it an invitational concert series called “Voices of the Far East”. Eastern Youth were the headliner each time, and invited one or two bands to support them. The great thing about it was… they always planned ahead. They got into a rhythm of marketing their events. Also, all of that effort went into promoting THEIR band and growing their fan base. Provide an attractive price to entice people to come time and time again. Perhaps some proceeds from the show go to a charity of your choice. Brand the concert series more like a festival with advertising, sponsors, partners, local press, radio, and it becomes a widely respected and recognized part of the community. As a result, each time you do a local show, it’s a big event and well attended. Plan to play regional concerts so that you don’t overplay your home market. You can apply all the promotional tips in this article to each event. The goal is to increase your turnout each time you return to these markets. Keep building your fan base through personal interaction on stage and at the merch table. Use an email signup list and keep in touch with fans on social media. Imagine this. A band with an all ages (under 21) audience accepts a show that costs $15. The set time is midnight on a Wednesday night, and the club is 21+. There is absolutely no reason to waste time with this event. No amount of promotion and marketing will get your younger audience to this show. Keeping in mind you don’t want to overplay your market, choose your venue and show carefully. If your music appeals to a high school demographic, play midday concerts on a weekend at an all ages venue. Consider your location, venue size, and costs to rent the venue. Outdoor venues are a challenge because of extra production costs and weather considerations. Developing artists should set a reasonable ticket price. High ticket prices can kill your concert turnout. A thorough budget and careful planning will ensure you don’t get screwed. By planning and promoting your own event, you are putting the outcome in your own hands. You have control and can plan for problems. First, determine what the financial goal is. Will it be a for-profit concert or for charity? If there is a ticketing company, what percentage do they take? Don’t just estimate the amount of tickets sold and multiply by the ticket price. That is not your budget. Do the reverse. First add up all of your expense on an Excel spreadsheet. Then work backwards. Take all of your expenses and determine what price you need to set for tickets. This will ensure you have your costs covered and some profit leftover for yourself. Adam Jankie and Sara Donelly from Illusive Entertainment have a great 3-part video series. They’ve booked hundreds of events over the years, and get straight to the point. Like any successful event, make sure you set yourself up for success. Don’t book a concert the same night as a major competing event that your fans will already be at. Avoid college towns when school is out of session. Venue size and type are important. A low turnout can be be a bummer for you, the promoter, and most of all – the fans. So don’t book a venue that you can’t fill at least 70% or sell out. If you’re not confident, it’s better to book a smaller room and sell it out. Twitter gives you a list of events. Click the profile icon to get a dropdown. Select “Analytics”. In the top navigation, click Events. Supporting other artists is a good strategy. Throughout this article, I encourage artists to earn a reputation as a headlining act. But when choosing to support, the deciding factor should be how likely the concert is to sell out or have a successful turnout. Review all of the factors in this article to determine whether this show was set up for success or failure. Only agree to play concerts that are booked at the right sized venues, with good promotion, and at the right ticket price. Often times these promoters are using the bands to fill their venue on a slow night. If they were confident in their decision to book an artist, would they really need a local opener to sell tickets for them? Be cautious of this trap. If there are doubts that it’s going to be a half full room, don’t confirm the concert. If everything looks good, and it looks like a positive situation, do your best to promote the show like it was your own. Music fans like to attend exciting events and be witnesses to something great. Promote each of your concerts like it was a festival or big event. Major events have sponsors and partnerships with brands and local businesses. Pitch your idea to these sorts of companies, and get them involved. Choose your special guests carefully. They should be viewed similarly to brands and partners. What do they have to offer in the way of turnout or marketing? It would be great if they bring out a different audience, from a different part of town, or younger or older. Trade shows with regional bands so that you can support them in their home market. Don’t overplay. Make each event special and don’t play with the same artists over and over. Play with a variety of new artists. Go outside of your market and build your audience in the region. Avoid playing the same set too often in one market. Make sure to have new material each time you play. Now that you know how to plan a concert, you need to promote them like any other product. Some bands create a marketing plan for each live event. In my experience smaller venues and “promoters” for local bands and smaller shows don’t do a very thorough job of “promotion”. You have to take this into your own hands. Spotify QR reader code can be printed on anything (sticker, business card size takeaway, etc). The code can lead back to a playlist of your music or music from the tour. Google and Facebook ads that are geo-targeted for your concert, or tour markets. Local music weekly print ad. Pool resources amongst other artists to place a 1/8 or 1/4 page concert ad in your local weekly or monthly music paper. Finally, for national tours, if you have sponsorship partners, consider buying a print ad in the best music magazine in each market. Ask the promoter for their local press list. They will probably be happy to share it with you if they know that you will be helping with the promotion effort. And this shows them you know how to plan a concert. Many artists assume if they simply make music and play shows, they will build a bigger fan base. It’s assumed that each concert will lead to a bigger concert and their fan base will grow. This is the wrong way to look at it. It’s actually the other way around. First of all, make as many fans as you can online, with street marketing, and with media. Then get fans to come to your concert. Therefore, if you’ve already softened the ground before the concert, you have a much better chance of growing your audience and selling merchandise. Also, you will impress the promoter because your band will stand above the other bands on the bill. Most artists don’t try to convert concert goers until the night of the show. That’s a mistake. Make sure to list your concert on Songkick, BandsInTown and the other concert listing websites. Many artists forget to go and update Facebook and their website with the concert information. So it’s crucial to add dates on Songkick because it will show up on your Spotify profile. If you want your audience to continue to grow from show to show, don’t sit back and expect the same people to come to every show. Because each concert presents a challenge to reach new people. Therefore promote and market the concert to a new audience each time. Here are some tips to make it your best concert ever. E-mail list signup / pen & paper / iPad. Offer something free in exchange for a sign-up. Finally, sell/pre-order something new. New album or track coming. Take pre-orders. Leave them with a sticker that has a link to check out a free MP3 of a new track coming out. (could be included with any purchase) Here is an article on how to make your venue sales count towards the album charts. So, I’ve set out to show you how to plan a concert that will entice people to come back to your next event. Getting more fans and repeat business is key. You can apply the tips in this guide for one off gigs, concerts, and festivals, or for your regional and national tours. The same rules generally apply. What are some creative ideas you’ve seen from other artists or your own? Share them in the comments below.